Eventually, all roofs will need to be replaced, whether due to storm damage or simply accumulated wear and tear over the years. Roof replacement is a big undertaking, and it may seem daunting if you’ve never had to do it before. To make the process as stress-free as possible, it helps to know what to expect. In today’s post, Bradford Xteriors, a leading local roofer, provides a detailed look at this home improvement project. The first step is to hire a reliable, experienced roofing company. They will arrive at your home on the day of the installation and begin by prepping the area. Roof replacement is messy, so expect them to protect the other exterior components like siding, walls, bushes, plants and the ground surrounding your home. Protection plywood, tarps and drop cloths are often used to cover vulnerable areas. Also, they will set up a garbage container near the work zone to dispose of the old roofing materials that will be removed before the new ones can be installed. Next, the roofing and siding installation pros will begin prying the shingles off your roof. Removal starts from the ridge cap shingles and then to each row of shingles down to the eaves. All that’s left will be the wooden deck or sheathing. The pros will then inspect the bare roof, replacing any soft, wet or rotted wood. Re-nailing the sheathing keeps the surface attached to the rafters. A more rigid roof structure allows the new shingles and underlayment to remain intact once installed. Every roofing company knows how valuable the underlayment is to the health of the roof. A properly installed roof can still let a bit of water in, which is why this component must be installed to prevent the wooden deck from rot. During this step of the roof replacement, your roofer first places the drip edges. These prevent water from penetrating underneath the roofing material along the edges of the roof. Next, ice and water shields are installed at all roof penetrations like chimneys and vents. Felt is the next material to be installed, which prevents shingles from sticking to the wood. In this phase of the project, it’s critical that your contractor follows the shingle manufacturer’s installation guidelines. The roofers will work from the bottom up, starting with the starter shingles that are installed at the bottom and sides. Each row of shingles is staggered to prevent water leakage. Nails will be driven to hold the roofing materials in place. Placement is crucial here—nails must be under the shingles’ tar strips to conceal the heads. Flashings are metal roof components installed over roof joints to keep rainwater or snowmelt out, which also helps keep your siding installation intact. These can be found on roof valleys, vents and drip edge. Before replacing them, your roofer will check how they were originally installed and replicate what was done. Different areas of the roof require different forms of flashing. For instance, a chimney requires step and counter flashing. Old flashing over the roof valleys must be replaced because it takes the brunt of the elements. Depending on the scope of the project, a roof replacement may take days to complete. Before calling it a day, every reliable roofing company will take the necessary time to clean up the work site. Once the project has been completed, the roofers will dispose of the old materials and debris as well as remove the temporary protection they laid out over your exterior. The roof is now 100% replaced. All that’s left to do is to perform a meticulous post-roofing inspection. This is the roofers’ way of ensuring every step of the roof replacement project has been done correctly. Now that you know what to expect in a roof replacement project, keep in mind what needs to be done moving forward. Scheduling routine inspections and maintenance with your roofer saves you money from expensive repairs. It is always a great idea to take a proactive approach when it comes to ensuring the whole system performs well and protects your home from the elements. 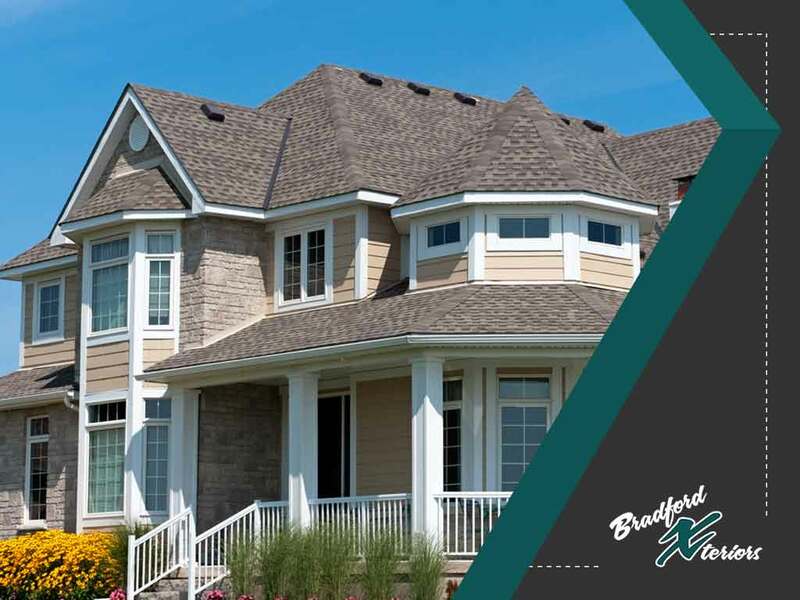 At Bradford Xteriors, our trusted and certified roofing technicians specialize in taking care of any weather damage your roof might have sustained over the years, including snow, hail, wind and ice damming. Don’t wait until your roof springs a leak or you start to notice mold or mildew in your attic. Know that minor problems can turn to bigger issues, so it’s best to have your roof inspected regularly to stay ahead of damage. As an Owens Corning Preferred Contractor, we can suggest a new roof based on your personal taste and wallet. We stand by the roofing products that we offer and the roles they play in protecting your investment, which is why we offer 50-year workmanship warranties on residential installations. Aside from roofing, we also perform siding installation. Call (614) 328-8188 to get started. You may also fill out our contact form for a free, no-obligation quote. Our Ohio service areas include communities in Arlington, Columbus and Dublin.